The forward market allows investors to trade forward contracts on currencies on the global currencies markets. A forward contract is an agreement between an organization and a commercial bank to exchange a specified amount of one currency at a specified exchange rate (also known as the forward rate) on a specified date in the future. Why would a corporation ever need a forward contract? Consider a multinational corporation operating in Finland anticipates a future receipt of foreign currency such as the Chinese Yuan from a customer in China. When such a need arises, the multinational corporation can lock in the rate at which they purchase or sell a particular foreign currency. This is known as hedging a currency. Usually forward contracts involve very large corporations expecting merchandise from a foreign currency and expecting to pay the supplier in their local currency. Therefore, a typical forward contract is valued at a minimum of $1 million US. Thus, forward contracts are normally not used by small corporations or individual investors. When a large corporation goes to obtain a forward contract, and if the bank has a doubt in its ability to make future payments, the bank could ask for a small upfront deposit to ensure the corporation will be able to repay. This type of a deposit is known as a compensating balance and no interest is received on any sums deposited. Most common forward contracts are for 30, 60, 90, 180 or 360 days. Therefore in just a matter of 90 days, the corporation would require an additional $50,000 to purchase the same $1 million Aussie dollars. Terrible isn’t it? Well that is how financial & currencies markets work. 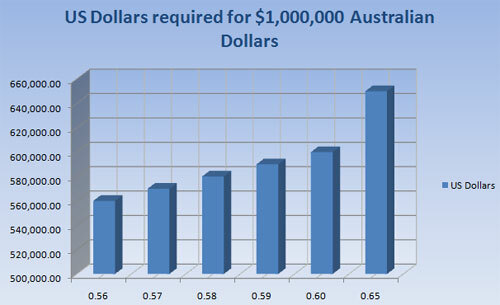 To avoid this type of risk to exchange rate fluctuations, the company can hedge or lock in the rate it will pay for Australian dollars 90 days from now without having to make any cash payments now. To put it in technical terms, Mike Tee Corp. can negotiate a forward contract with a bank to purchase Aussie $1,000,000 90 days forward. September 1st, 2009 Spot rate = $0.60 (locked in by Mike Tee Corp). December 1st, 2009 = Delivery date (this is the date when the company will deliver the US$ 600,000 to acquire $1 million Australian). December 1st, 2009 = Spot rate as of this date is $0.56 US. Thus if the forward contract rate drops from $0.60 to $0.56 in 90 days, and Mike Tee Corp. locked in a rate of $0.60, than it will be paying an additional $40,000 on December 1st, 2009 when it delivers the US $600,000 funds to acquire $1million Australian as of this date. It could have on the other hand paid only $560,000 to acquire that same $1million Australian if it had NOT locked in the hedge rate. You follow this example? This is the risk of trading & hedging currencies; it can work in your favour, and many times against your favour.